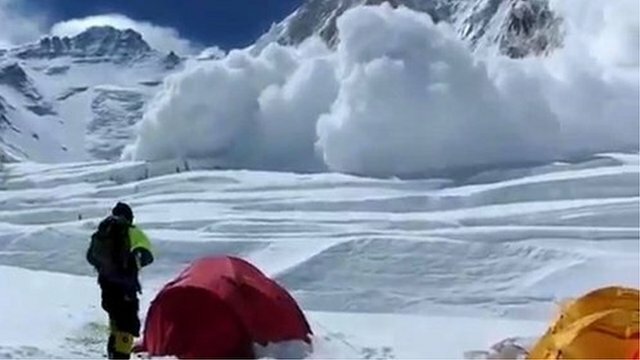 Avalanche on Mount Everest, from BBC News. By several tornadoes causing phenomenal distress. By the outright racism the LA Clippers owner displayed. That genetically modified foods be labeled for the buyer. To long-term climate change with very little doubt. Expanding where concealed firearms may be carried at will. And school zones too, which may bring the wrong kind of fame. With rival groups Hamas and Fatah claiming to settle their beef. Viewing Hamas as a group of terrorists, Israel called off a negotiation. The “heinous crime” of the Holocaust, as Fatah leader Abbas announced. He insists Abbas choose Israel over Hamas for peace to be made. Since the US withdrew its troops from most sections. 57 were killed Monday alone at political events. From Christian-led violence in the capital Bangui. After a Muslim rebel group gunned 16 civilians down. After an avalanche left at least 13 dead in its track. And tensions are arising over their pay and their care. I’m glad to share with you the news and your time! I thoroughly enjoy chatting about the news, so say hi below and share your views!